The Pavilion, the $125 million first phase of the much anticipated Durbin Park development by Gate Petroleum and Gatlin Development, is now underway. Located at Race Track Road, West Peyton Parkway and SR 9B near Bartram Park, the 80-acre, 644,440-square-foot Pavilion at Durbin Park will be anchored by bix box retailers Wal-mart and Home Depot. In addition when it opens in 2018, it will feature five outparcels, including Gate Petroleum and Chick-Fil-A, and 341,590-square-feet of retail space for junior anchors and specialty retailers. The first retail power center in North St. Johns County, it will serve an area with a 3.54% annual growth rate, with 54,600 residents spending an estimated $540 million annually on retail goods, within a five mile radius. Phase II will follow the completion of the Pavilion at Durbin Park by 12-18 months and will include lifestyle retailers, restaurants, entertainment venues, and a Bass Pro Shops. To differentiate itself from other regional retail districts, a 3.5-acre interactive park will serve as the focal center point of Durbin Park’s second phase. Elements of the park will include a playground, water features, a merry-go-round and a temporary ice skating rink in the winter. 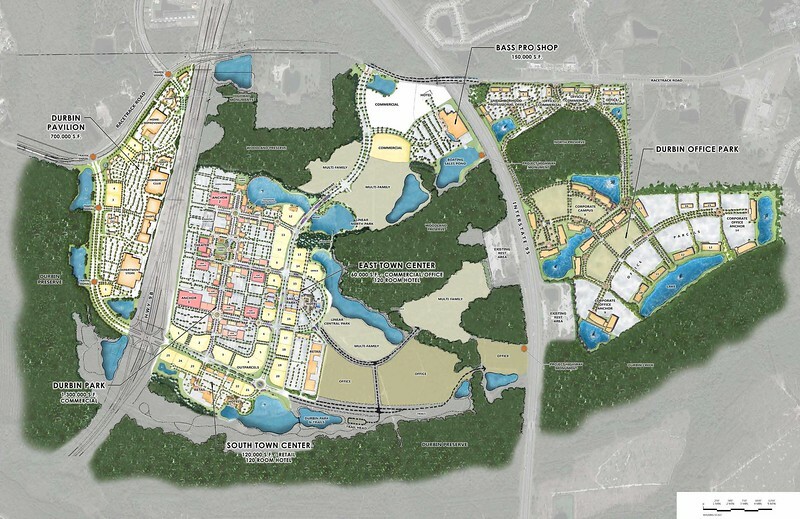 Future phases of the development include an office park and additional retail east of I-95. When fully built-out, Durbin Park will encompass 2.4 million-square-feet of retail, 2.8 million square feet of office, 999 units of multi-family, and a 350 key hotel on a 1,700 acre site featuring greenspace, bike trails and lakes.